There has been much talk of alternative fuels to keep our classics going as petrol becomes ever less attractive. But after all is said and done, more has been said than done. Here is a brief summary of my experience and some hearsay from down the pub, it is quite possible I have made a mistake here or there so if you spot one do let me know. 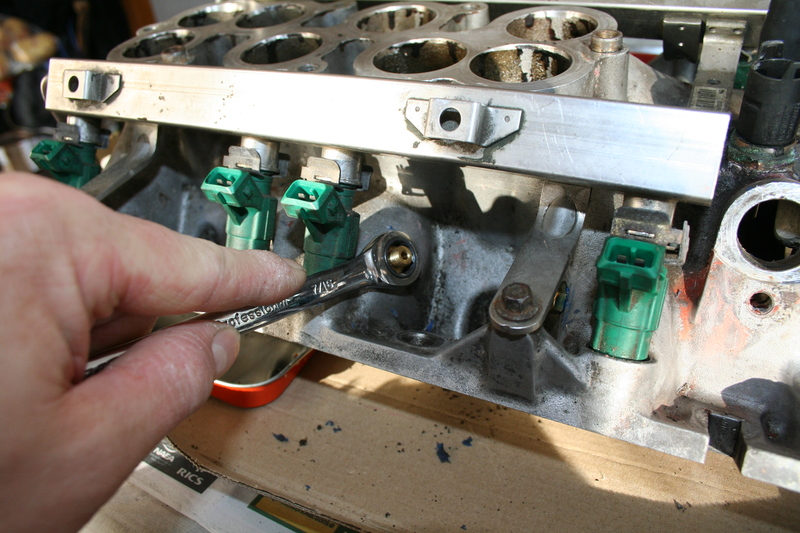 Here I’ve drilled into the intake manifold and I’m fitting LPG injector nozzles to one of our Rover V8s. Mostly Propane with a splash of Butane, stored as a liquid under a pressure of about 5 bar in steel cylinders. The fuel is turned into a gas and the pressure regulated in an evaporator that is heated by engine coolant. The simplest way of feeding the gas into the engine is by using a gas carburettor, but these are quite restrictive and so peak power is significantly reduced, maybe by 20%, although most drivers don’t notice this for some reason. Often these systems are set up to run very rich to mask installation problems. Better way is to use gas injectors, similar to petrol injectors, with their own ecu, this is more expensive but more efficient. LPG is usually less than half the price of petrol per litre, and although the fuel consumption on gas is slightly worse there is still an overall saving. A well set up system will have lower HC and CO emissions than petrol, but the higher fuel consumption leads to similar CO2 levels. LPG has a higher octane rating and so engines can be redesigned with higher compression ratio to achieve higher power and economy, but again that is expensive. As LPG is a dry fuel there can be issues with valve seats wearing, but only if the engine is worked hard. Special lubrication systems are available but many have problems with uneven distribution between the cylinders. LPG supply is directly related to oil supply, so if petrol runs out then so does LPG. This is the same gas as you get in your domestic cooker, Compressed Natural Gas. On cars it is stored in very high pressure cylinders. 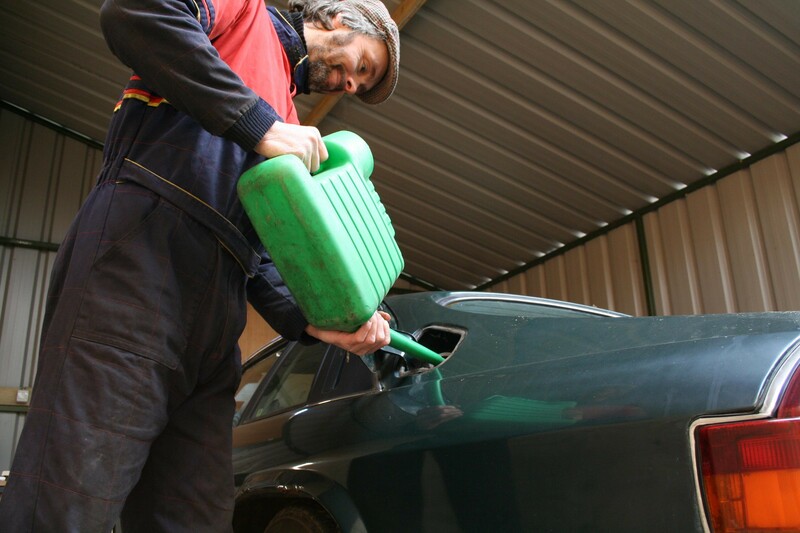 You can get domestic pumps to fill the car from a household supply. The regulator and engine conversion equipment s similar to LPG, but with different flow rates. Again there is a power loss, slightly greater than LPG but not horrific. Also the valve wear issues are similar to LPG. An alcohol fuel with a fairly low energy content, so less power than petrol in a standard engine, but the high octane rating means that add a turbo or supercharger and you can have a very powerful unit. But if you’re happy with the power loss on a standard engine then home brewed methanol could be a cheap alternative to petrol. Unfortunately it’s very hydroscopic so cant be stored for long periods. An alcohol fuel with a fairly high energy content and octane rating, it makes a small gain in power on standard engines but can make even better gains on a modified engine with higher compression ratio or a blower. It is very hydroscopic so has a limited tank life, it also has an unfortunate tendency to react with steel creating an acid that corrodes pretty much everything. So stainless or plastic fuel pipes, tanks and fittings are helpful. The exhaust is also corrosive so stainless systems are best. Alcohol fuels can be brewed in much the same way as moonshine, using food waste, but getting the water out is very difficult. Flow rate is much higher than petrol, so the fuelling system has to be modified to suit, although some conversions have managed to use standard injectors and fuel pumps. It has no carbon and the only emission is water. Unfortunately its very difficult to store, requiring cryogenic tanks. As it is the smallest atom it tends to leak through pretty much anything, including steel. It also needs either very high pressure tanks or cryogenic (-253.7 ºC) liquid storage. The other problem is that its energy density is quite poor, so you need a lot of it. If it is injected into the port it displaces quite a lot of air, so power is significantly reduced. But of course this could be tackled by using a bigger engine or turbos, yes its true, with hydrogen you can have a guilt free 8 litre V8! British company ITM Power have developed a home hydrogen generator, simply add water and plug it into the mains, to prove its usefulness they converted a Focus which gets about 100 miles per fill. And Sunderland university have used CNG (compressed natural gas, mostly methane) equipment, which is similar to an LPG conversion, with a special tank to run a standard car on Hydrogen. Again it’s a dry fuel so valve seat erosion can be a problem if worked hard. Another brewed fuel, usually made from oily seeds or waste cooking oil. Quite expensive to produce on anything other than large scale industrial quantities. ‘Phase 2’ biodiesel is made from farm waste (husks and stalks left over from food production) and is more expensive but does not use up the worlds food supply. Performs just the same as regular diesel as long as it is filtered properly. Because of the greater solvent content it will loosen any old fuel deposits from an old cars fuel system, which can clog filters and injectors, so its best to fit a new fuel filter then run biodiesel briefly before changing the filter again. Being an organic substance it is prone to stuff growing in it, so it has a limited tank life. Some people run older diesels on filtered chip oil, there are lots of microscopic plant particles in this which carbon up the injector tip and can coke up the engine. The harder the engine works the worse the problem gets. Using modern diesel can wash some of the deposits away, so alternating fuels can extend service life. Modern diesels use much finer tolerances in the injection system and are a lot less tolerant of this type of fuel, but old fashioned mechanical diesel injection systems don’t seem to mind so much. Throw the engine away and fit a milk float motor? It has been done, in fact I did it to a Fiat X1/9 but that’s another story, but you have the performance of a milk float and the batteries are very heavy and take up a lot of space. However, recently the century of pitiful investment has come to an end and the technology is finally getting proper funding. We now have electric sports cars, and even a few supercars. So over the next few years expect to see much more viable electric drive systems and batteries. Personally I would love to develop a replacement electric system in the shape of an engine, I think that would be rather fun. Advanced fuels from petrol stations. Things like BP Ultimate and Shell V Power are formulated to coat the cylinder in a low friction coating, improve oil control and disperse more effectively to improve flame efficiency. This does actually work, an engine improves over time with use as the coating builds. The fuels cost more which can negate the economy benefit, depending on the engine and how much difference the fuel makes on that particular design. Mixing about 3% by volume hydrogen in the intake air can allow a petrol engine to run very lean, in this condition it is possible to gain 25% in efficiency. Maximum power will be reduced due to the displaced air, and the hydrogen requirement is quite large so generating it by an on-board electrolysis system is not usually viable. Also the engine change to make use of the lean burn potential is significantly expensive. Introducing hydrogen without running the engine lean makes no improvement. Using a jam jar of water and 12v electrodes is just plain silly. A variation on this theme is to use thermal and catalytic cracking on the petrol to turn it into hydrogen and CO2, with engine modifications this can improve efficiency by up to 30% at part load. But its a very expensive system and complicated to control. Can improve efficiency by up to 20% but makes an even more dramatic improvement to performance. Over doing it will melt the engine, much like nitrous oxide on a petrol engine. Cheaper than a conventional LPG conversion, this works very well indeed if set up properly. The following things really don’t work. Magnets, they have no effect on fuel what so ever. Solid fuel ‘catalysts’, I have tested a few and none made any difference. Anything involving running your car on water.